People have swum in Merri Creek at Coburg, near the site of Coburg Olympic Pool, for a very long time. The banks of the Merri Creek were important fishing and ceremonial locations for the Wurundjeri. 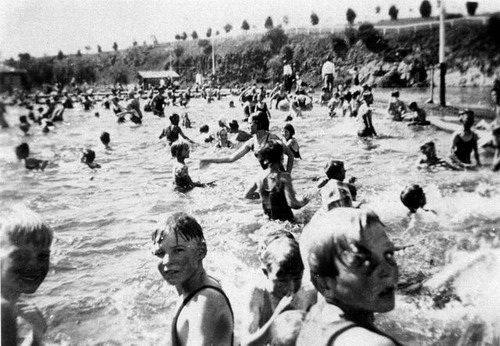 Coburg Lake was a popular Melbourne swimming destination early last century, peaking in the 1920s. Coburg Lake had wading pools, a diving board, bathing sheds, as well as band on a Sunday, and a kiosk. 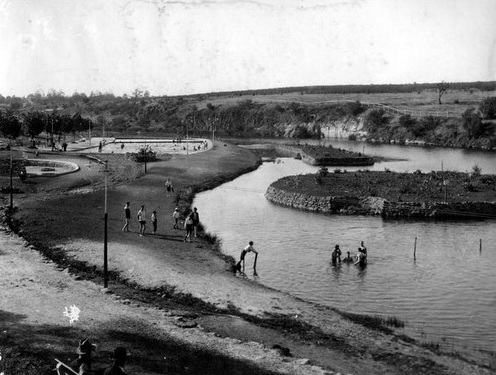 The Coburg Olympic Pool was built to replace the creek (and lake) as a swimming spot for local children. In 1958 the Coburg Lake was closed for swimming due to water contamination. A week before this, 2 girls drowned in the Merri Creek in East Coburg . ‘A citizens committee started to raise funds for a swimming pool near the lake. The Coburg Olympic Pool finally opened in 1965, paid for by a special rate, grant and loans moneys.’ (quote from p325). Coburg Olympic Pool is what we have left of swimming in Merri creek and we should not be so quick to talk of economising and centralising. I agree, when you walk down near the creek there, or go to the lake the history just makes such sense. It's that sort of spot.